Dennison Manufacturing Co., Art and Decoration in Crepe and Tissue Paper, 1917. It's American Craft Week and once again the Dennison Manufacturing Co. catalog, from the trade literature collection at the National Museum of American History Library, has a plethora of creative craft ideas. This featured image centers around do-it-yourself decorations for a bridal party. 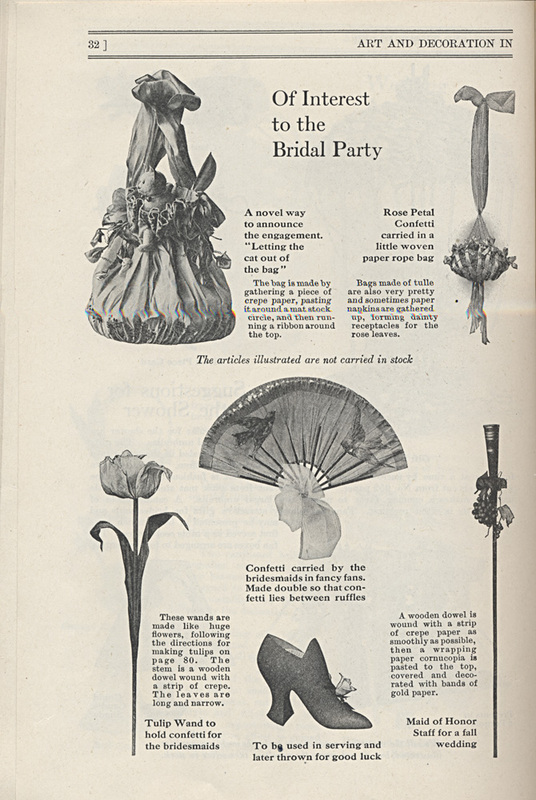 Why not make a confetti wand that looks like a tulip, or a maid of honor staff (a what?—the catalog is from 1917 …), or you could even make shoes that can be used to serve (what, I'm not sure exactly), and then thrown at the bride and groom (!) later. The innovative uses of tissue paper never end. But the most ingenious and perhaps strange idea of all is the little tissue paper cat who is struggling to jump out of the bride-to-be's bag. The most enjoyable aspect of perusing the Libraries trade literature collections is running across such quaint and strange retail offerings from America's past. Happy crafting! Next Post Do Love Apples Count, Too?